August 23rd is the 235th day of the year (236th day in leap years) in the Gregorian calendar. There are 130 days remaining until the end of the year. On this page, we have placed information about August 23rd, including famous people born on, historical events that occurred on, holidays and observances that fall on, and astrological connections of, this day. 476 Odoacer is proclaimed King of Italy (usually seen as marking the end of the Western Roman Empire). 1305 William Wallace (Scottish military leader) is executed by the English. 1799 Napoleon leaves Egypt for France. 1821 Mexico independent from Spain. 1866 Austro-Prussian War ended by the Treaty of Prague. 1873 Albert Bridge opens in London. 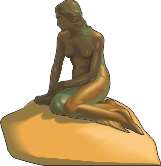 1913 Little Mermaid statue unveiled in Copenhagen, Denmark. 1921 Faisal I crowned King of Iraq. 1948 World Council of Churches formed. 1954 Maiden flight of the C-130 Hercules transport aircraft. 1991 Armenia declares its independence from the Soviet Union.